Coastal News Today | Virginia as the "Silicon Valley" of sea level rise? It could happen. 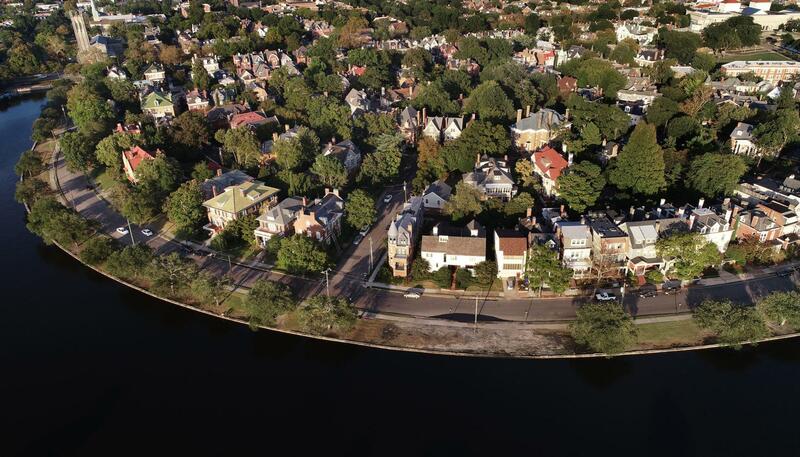 Stephen M. Katz | The Virginian-Pilot An aerial view of Norfolk's neighborhood around Mowbray Arch during the evening high tide on Wednesday, Oct. 3, 2018. Virginia is looking to build up its water management economy, and figure out innovative ways to respond to flooding issues. But some are looking at the rising seas and sensing opportunity. "What we haven't seen yet is sort of the Google of climate change," said Robert McNab, an economics professor at Old Dominion University who worked on the Florence impact study last September. "Cities and regions will be competing over the coming decades to essentially become the next Silicon Valley with regards to climate change and sea level rise," McNab said. The cities and states that best show they can adapt and have a willingness to solve a problem will see a cluster of engineering and architecture firms wanting to move in to help out. The question of who becomes the hub is up for grabs, McNab said, but Virginia appears on its way. The commonwealth is one of those states looking to build up an economy around what experts call water management. It joins California, Washington, Louisiana, Florida, Massachusetts and New York, among others. Virginia boasts one of the fastest acceleration rates of sea level rise in the country. Ann Phillips, a retired Navy rear admiral who Gov. Ralph Northam appointed as his de facto sea level rise czar, is tasked with creating a first-of-its-kind coastal resilience master plan. That plan will help figure out where cities and regions stand on responding to rising seas, and help them improve. Armed with that information, cities and regions along with companies can move forward on solutions, experts say. "There is a broad interest in the state in being able to take advantage of what we learn and share that with others," Phillips said. "A piece of that has a potential to be economic lessons learned."